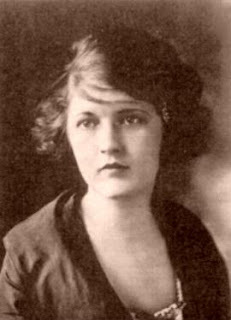 Courtesy of the Writer's Almanac, I learned today is the birthday of Zelda Fitzgerald, born Zelda Sayre in Montgomery, Alabama (1900). "She was the wife and muse of the novelist F. Scott Fitzgerald. She met F. Scott Fitzgerald at one of the military dances, and he stood out from the crowd in his fancy Brooks Brothers uniform and cream-colored boots. Zelda said, "He smelled like new goods." He told her that she looked like the heroine in the novel he was writing. They went on their first date on Zelda's birthday, July 24, 1918. She never forgot that day. Years later in a letter to Scott she wrote, "The night you gave me my birthday party ... you were a young Lieutenant and I was a fragrant phantom, wasn't I? And it was a radiant night, a night of soft conspiracy and the trees agreed that it was all going to be for the best." Their marriage was difficult. Scott struggled with alcoholism and Zelda struggled with schizophrenia, but they were the quintessential literary couple of the Jazz Age. They were so famous that William Randolph Hearst hired a reporter whose only job was to cover their activities. They looked so much alike that people sometimes mistook them for brother and sister. Lillian Gish said, "They were both so beautiful, so blond, so clean and so clear." Dorothy Parker said, "[They] looked like they'd just stepped out of the sun." Note: Zelda is the author of "Save Me the Waltz," among several other novels and autobiographies.